iSize infant car seat with iPlatform base included. Installs with the i-Size Isofix base in the car. The new iMATRIX from Jané is the new i-Size version of the popular Matrix. It is designed to protect your baby in the car and is suitable for use by children with a height of between 40 and 83 cm which is from birth to 15 months approx. It is now even lighter than previous Matrix versions, reducing it previous weight of 6 kg down to just 4.6 kg, that's more than 20% lighter! iMATRIX has been designed to be installed in the car together with the iPLATFORM from Jané. Always in the rear facing position, this base uses ultra-quick connectors with Pro-fix locking. Anchored to the car with isofix and a front anti-rotation leg for complete safety and reliability. This is the safest installation system, as it prevents any installation errors that could affect safety.. The iMATRIX's unique adjustable headrest feature means that your baby's head is in a better position when sitting up and especially when he is over 70 cm tall. This increases the interior space of the baby carrier. Newborn babies should ideally lie completely flat, as recommended by health officials. This position unlike conventional infant car seats doesn’t have any time restrictions a newborn can travel in it. It also facilitates newborn respiration, nurtures the abdomen and aids optimal spinal development. The Jané iMatrix iSize innovative design recognises these important requirements and allows baby to travel in the lie-flat position on the pram chassis or as a carrycot. 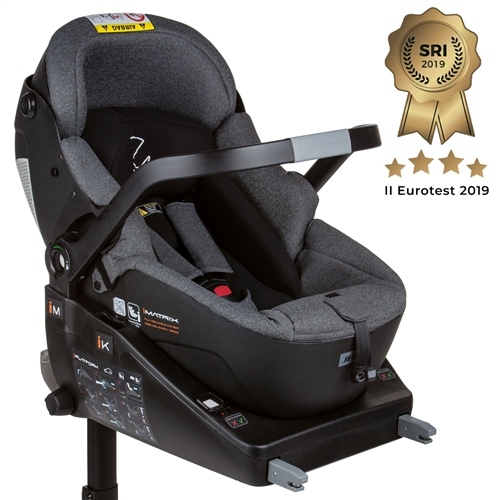 In the car, the iMATRIX has been designed to be installed together with the Isofix iPLATFORM base and always in the rear facing, sitting-up position. which has less chance of being incorrectly used than belted car seats. Locks and unlocks the car seat with just one movement - no more awkward fitting kits. iPlatform iSize Isofix base is included to ensure it is extra stable and safely fitted. Means that your baby's head is in a better position when sitting up and especially when he is over 70 cm tall. Jane UK antwortet: Yes your car has been tested with the iMatrix iSize car seat and fits perfectly well. In fact the iMatrix will fit all modern cars that have ISOFIX and the only things to check for, as with all car seats, is that any AIRBAGS are switched off on that seat position, and that the floor in which the support leg is placed onto is solid; no underfloor compartments. If it does have a compartment, then you need to speak to your car dealer for a filler, or check that the support leg can extend to the solid floor of the compartment.